What does J. East China Norm. Univ. Natur. Sci. Ed. stand for? J. East China Norm. Univ. Natur. Sci. Ed. 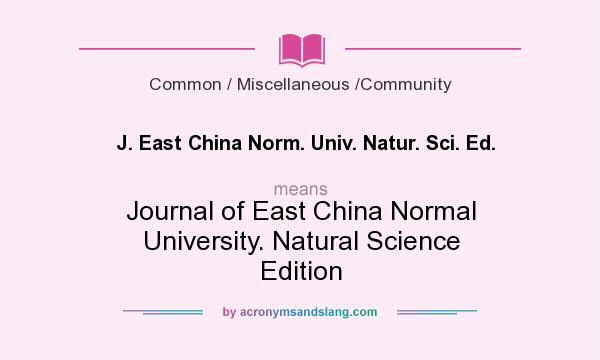 stands for "Journal of East China Normal University. Natural Science Edition"
How to abbreviate "Journal of East China Normal University. Natural Science Edition"? "Journal of East China Normal University. Natural Science Edition" can be abbreviated as J. East China Norm. Univ. Natur. Sci. Ed. What is the meaning of J. East China Norm. Univ. Natur. Sci. Ed. abbreviation? The meaning of J. East China Norm. Univ. Natur. Sci. Ed. abbreviation is "Journal of East China Normal University. Natural Science Edition"
What does J. East China Norm. Univ. Natur. Sci. Ed. mean? J. East China Norm. Univ. Natur. Sci. Ed. as abbreviation means "Journal of East China Normal University. Natural Science Edition"